– take the appropriate action to overcome these. The approach addresses the dual core of a change programme: processes and people. It has been researched and refined with the input of a wide range of experts in the field. In theory we all agree that the ‘soft’ elements (people, culture, innovation etc.) represent the critical factor in the success or failure of a change initiative, don’t we? The problem that we experience - at least here in the UK - is that we operate in a business culture that is largely reactive to issues that show up on the board’s radar rather than driven by any strategic intent or innovation. The main reason for this is the UK culture of "short-termism" where monthly and quarterly targets drive companies. The direct effect of this is that the focus in managing change in the workplace is nearly always on getting the quickest return by fixing the most obvious and glaring problems. 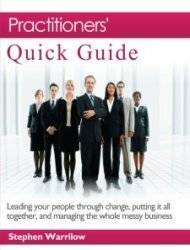 This focus on quick fixes often reflects a lack of investment in the organisation in the first place. 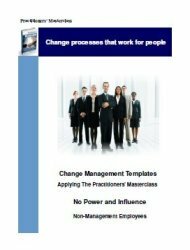 So change is seen as a sort of “magical toolkit” that will somehow get them through the aspect of managing change in the workplace they don’t like handling – the people issues - so that they can get to the aspect they do like handling - which is the money. This also reflects the all too frequent lack of clarity of what the change initiative is intended to deliver, and a "business case" for change based on knee-jerk reactions. 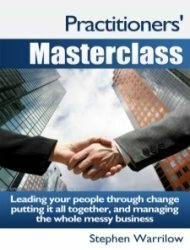 Whereas the reality is that managing change in the workplace is really all about being able to deal with complexity and "messiness" - with many stakeholders simultaneously - and dealing with a multiplicity of different views of the issues facing the company and how to deal with them! For change management practitioners the challenge is how to convince senior management that the "just do it" approach has a significant chance of failing. The secret is to develop a quantified analysis and business case for time and resources to tackle these issues and to communicate this in a language that the Board understands – impact on the ROI of the project. So how to turn ‘soft’ issues into hard financials? "I came up against this challenge when trying to argue the case for taking a more people-focused approach to change projects. It became clear to me in working with public sector organisations that most projects failed to deliver the planned benefits because the complexity of what they were trying to achieve was not within the capability of the organisation to cope with yet another change initiative. But senior management were not interested." 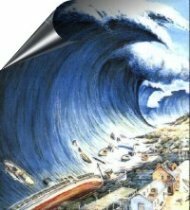 Assess the maturity of their capability to manage process – weakness here can spell disaster when it comes to bringing in new systems. Measure the level of distrust and lack of respect in relationships between people – the higher the high level of distrust, the harder it will be to achieve integration and the more time and effort you will need to overcome the barriers. Establish where the project lies on an Exponential Complexity scale, from ‘Simple’ to ‘Too Complex’, where the components include the scope, number of stakeholders and timescales. 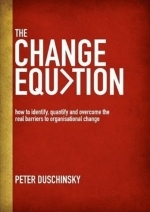 Change is how an organisation moves from one position and way of working to another. But knowing which direction and approach to follow requires that a clear strategy has been agreed and objectives are well understood by all stakeholders before embarking on the change. We identify any confusion and lack of clarity and, if necessary, revisit the strategic analysis and planning stages. The success or failure of a change project is highly dependent on the complexity of the project being within the capability of the organisation. In order to understand this, we look at the culture of the organisation, using the Kinston model, and its business process capability, using the Capability Maturity model. Putting these together provides a baseline: the Organisational Capability Indicator. In order to judge whether the change project is within the organisation's capability, we need to quantify the complexity of the project. We do this using the Exponential Complexity model. Once we have this data, we can analyse the gap between actual capability and that needed to realise the full benefits from the project. That gives us An ROI Impact spreadsheet showing the impact of the barriers on the business case ROI of the project. We workshop the outcomes of the assessment with senior managers to gain their ownership of the barriers and risks. We then deliver the Action Plan and Route Map that provides a clear, structured framework for success and shows precisely where skilled resources and tools need to be applied. At this point we access the knowledge and expertise of our Associates and Partners group to put together a costed Project Support proposal to provide the skilled resources, methods and tools the project needs to succeed. 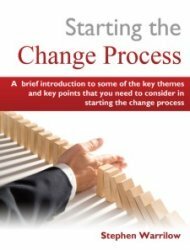 Organisational change means adopting new processes. But it's people who have to take on these different ways of working. And people don't like change. It's challenging, scary and takes a lot of additional work and effort. So organisational change will only happen successfully when people have been fully engaged and are committed to making it happen. And the more complex and far-reaching the change, the more it is critical that management recognise that this cannot be achieved within the lifecycle of the project – it has to start earlier to gain trust and go on beyond project delivery to embed the behaviour changes. We use the Trust/Cost model to assess the level of trust and sharing within the organisation, then apply the Change Equation approach to help people gain the confidence and trust to ‘invent their own route to the future'. Because it's people who make change happen, they need to be closely involved in the mapping of existing and ‘to-be' processes, which, in our approach, puts emphasis on the ecology of process change – the change is unlikely to change everything a person does, so it is important to make visible the impact of the proposed changes on the rest of that person's work, to reduce resistance to change. The best managed projects won't deliver the benefits without due attention to the culture and process issues we cover in our approach, but too many change projects fail due to poor project management. If necessary, after assessing the complexity of the project, we may need to bring in an experienced Project or Programme Manager to supplement in-house resources. We believe that behaviour is a product of the system you put people in, so we pay attention to the proposed new systems and processes, look at whether policy and practice changes are needed to the HR and employee rewards framework and, where appropriate, introduce innovation enabling software and other ‘levers' to bring about rapid culture change. Conventional change management interventions attempt to design and control the outcomes. This approach can block and constrain the naturally emergent patterns of learning and behaviour that are crucial in a complex project, where the outcomes are so dependent on people. We have the skills to recognise when it is right to put in place and support an enabling infrastructure to facilitate and enable the new relationships and behaviours. Change requires that people learn new ways of thinking and acquire new competences. To support this learning, we offer capacity-building coaching, mentoring and skills training, to individuals and teams. The way an organisation functions, its levels of trust and empowerment, are heavily influenced by leadership style. A good leader combines qualities that engage and empower people to achieve make the changes. While not everyone has these skills and capacities, they can be honed and improved through coaching and mentoring. Most change relies on influencing external partners: customers, suppliers, other organisations. Partnering and collaborative working are becoming the norm and these require careful planning and sensitive management. Our Organisation Culture and Trust/Cost tools provide a basis for mapping the landscape, then we bring in experienced facilitators and managers to generate and support the governance, contractual, operational and relationship management frameworks. Where the change depends on external suppliers to provide the new systems, infrastructures or outsourced functions, the project's success will be highly dependent on their capability. We have the experience in our team to ensure that procurement processes, supplier capability, IT plan etc. have been thoroughly scrutinised and appropriate risk management and contractual mechanisms put in place. The Project Readiness Assessment methodology lends itself to monitoring progress and ensuring that the project is going to plan. Because we focus on a wider set of data than conventional project healthchecks, we can spot issues and barriers that will hinder take-up and realisation of the project benefits and maintain focus on the organisational culture changes, which need to be supported and embedded well after the completion of the project itself. In cases where the project is going badly adrift or is no longer meeting the changing business objectives, the data we provide can help to justify stopping the project - something many organisations fail to do (with serious cost implications). Return to top of "Change Equation"